In this Case Study, we discuss how our range of hospitality products are perfect for Golf Courses, Hotels and Restaurants. Morley Hayes is an award-winning hotel, restaurant and golf course set in the Derbyshire countryside, 5 miles north east from the city of Derby and we are proud to have them within our customer portfolio. We initially contacted Andrew Allsopp, owner of Morley Hayes, in January 2012 with an invite to our premises. We showcased our high-quality, premium range of Folding Tents and Andrew was surprised and delighted with the quality and style of the products on show. This led to Andrew ordering two 2 metre by 2 metre Royal Ecru Folding Tents to be used as a reception and canape tents within the Morley Hayes garden for outdoor weddings and events. See image to left. 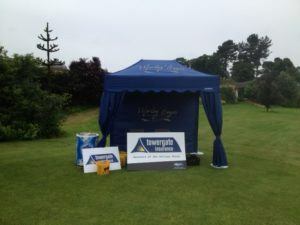 Having been delighted with the Folding Tents in the Wedding and Events part of the business, Dan Delaney, PGA Golf Professional and Golf Manager then ordered a 3 metre by 2 metre Royal Blue Folding Tent (see image to right) for a Golf Club Halfway House which is used for drinks, sponsorship and refreshments. This has been really welcomed by customers using the course. And it’s a great way of getting branding across for commercial golf days when businesses are playing the course with clients. Towergate Insurance was one of the first businesses to benefit from the Halfway House in this way. 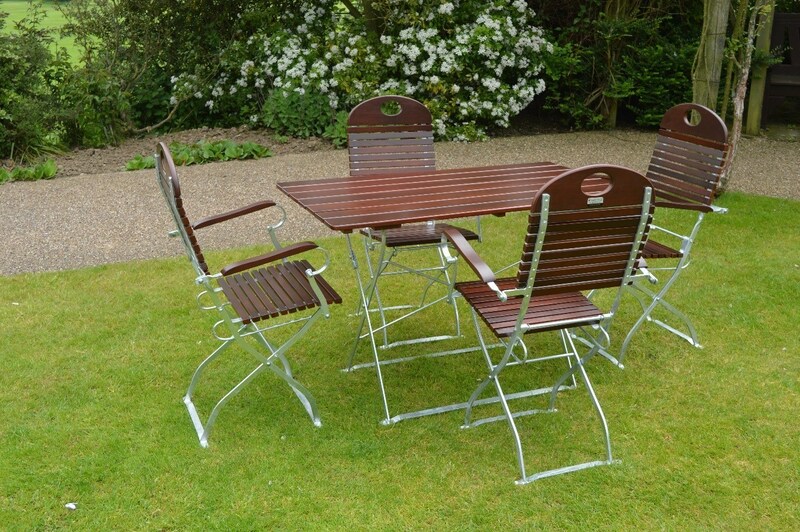 We gained another order in June 2016, when we supplied Morley Hayes with our range of high quality Premier Bistro range of outdoor furniture (see image to left). Having used this with great success over the summer, Andrew has confirmed he’ll be ordering more of our outdoor furniture for the 2017 outdoor season. 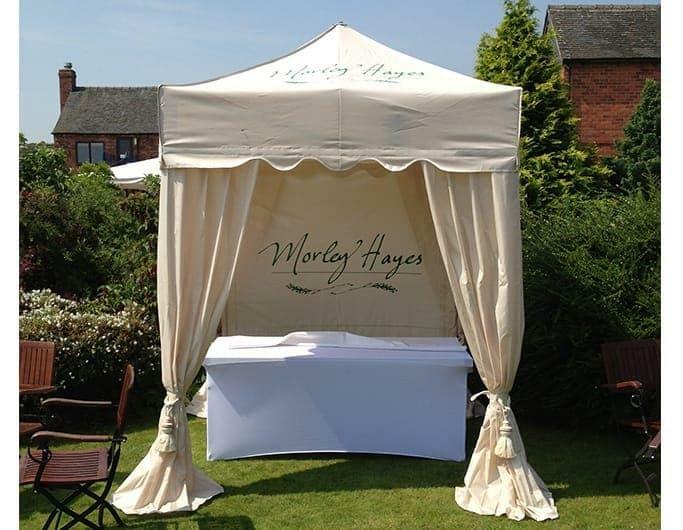 The business relationship with the venue is a good one, built on trust and respect and as with any outdoor hospitality products, Morley Hayes appreciate that the return on investment (ROI) is crucial. It’s about ensuring your investment lasts well over time, especially with the UK weather being as it is. It’s also important that any outdoor furniture reflects the brand image of the venue. Chairs, tables, canape tents, half way houses – they are all key in communicating a venue’s image. Unlike a lot of our competitors, we refuse to purchase low quality imports from the Far East. Everything we do is about high quality goods and customer service.